When you go out in jeans whether they are styled to be casual or a bit more glam you really want to wear the most flattering jeans for your body type. Sounds simple enough, yet many get it so wrong. This post has been written to give advice to those unsure of what style of jeans will suit them best and not to tell people what they can and can’t wear as that wouldn’t be fair as we all have our own tastes. 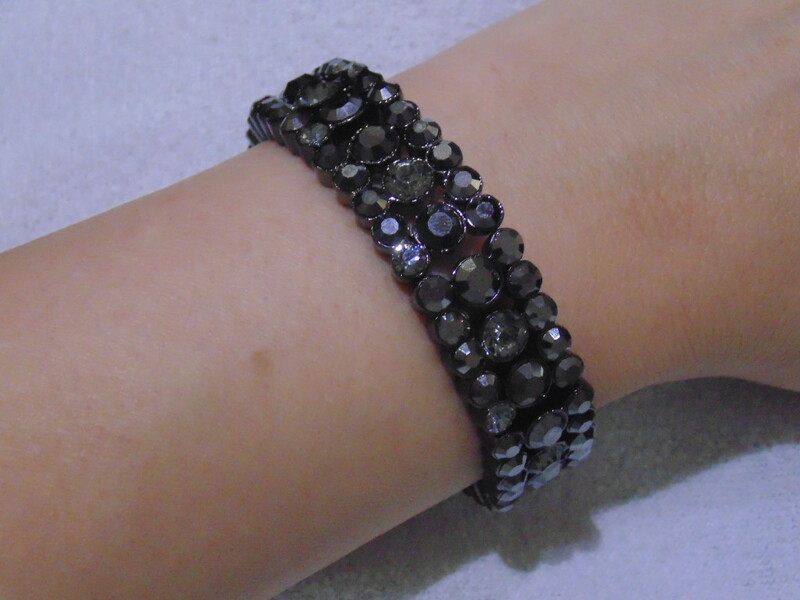 Before I go through the different body types and jean styles I wanted to include a little arm candy that would look wonderful with all the styles of jeans whether you are going casual or glamming them up. 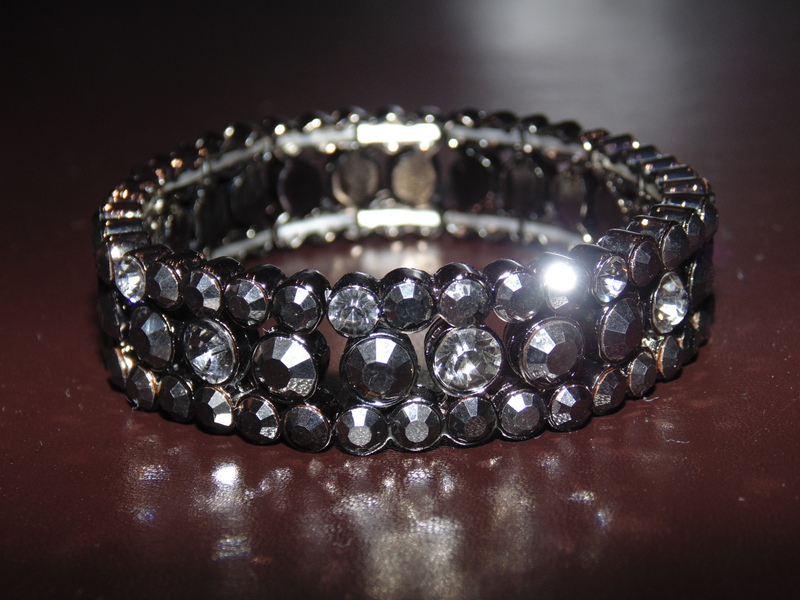 This pretty crystal stretch bracelet from Majique is just the piece to finish off any outfit and the crystals sparkle nicely to make this not only eye catching but also a jewellery box essential. What you need to know before you can choose the right jeans for your body shape is that the ‘rise’ of a jean is the measurement from the top of the waistband to the bottom of the crotch seam. High rise jeans sit under your bellybutton covering the hips and bottom. Seen on the likes of Kim Kardashian and Jennifer Lopez. Pear shaped women are smaller on top and have curvier hips, bottoms and thighs. A high rise flare, bootcut, skinny or trouser jean would look great as they make your legs look longer and help give the appearance of slimmer hips. 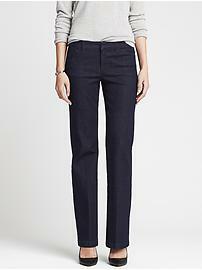 Trouser jeans look similar to trousers (simply put). These are generally found in dark washes making them more suitable as workwear. They fall in a straight line from the hips and take attention away from your middle area. Boot cut and flare jeans will help you look thinner but it is important to remember that you should always go for a darker colour (dark blue, indigo or black). Don’t go for jeans that fit too tightly as they will accentuate bulges. 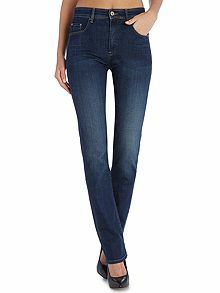 Straight leg jeans can look like skinny jeans on a pear shaped body. Go for a dark colour to flatter your figure the most and make sure the fabric of the jeans is a heavy one so one that falls rather than squeezes. Draw attention to the upper part of your body either with bold colours, eye catching patterned tops, long tops and or a chunky / sparkly necklace. Seen on the likes of Kelly Brook and Salma Hayek. This figure is best suited to a wide leg jean with a mid rise to show off your curves yet keep you looking slim in the right places. The styles of jeans are the same as with a pear shape. Apple shaped celebs include Elizabeth Hurley and Jennifer Hudson. 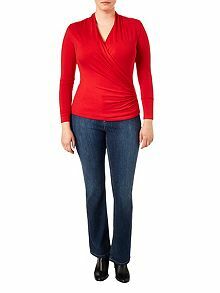 Apple shaped ladies are larger across their mid-section generally with slim legs and are best suited to straight leg jeans with a dark wash to complement their shape although bootcut and flare will also look good. Go for a mid to low rise jean. This Straight up and down figure is seen on the likes of Nicole Kidman and Cameron Diaz. This means your bust, hips and shoulders are the same width. 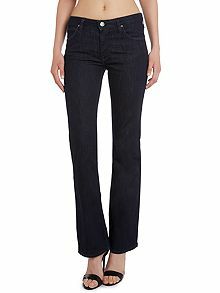 Mid rise bootcut and flare jeans look great on this figure although you can get away with most styles. 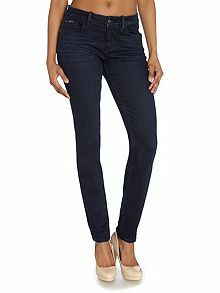 Whatever size you are make sure your jeans have some lycra in the fabric to help the jeans retain their original shape. As worn by Michelle Keegan available at Next. All jeans featured are from House of Fraser unless otherwise stated.